…Got my World Cup wallchart today at last. The arrival of the wallchart was a last-minute coup by my postman. 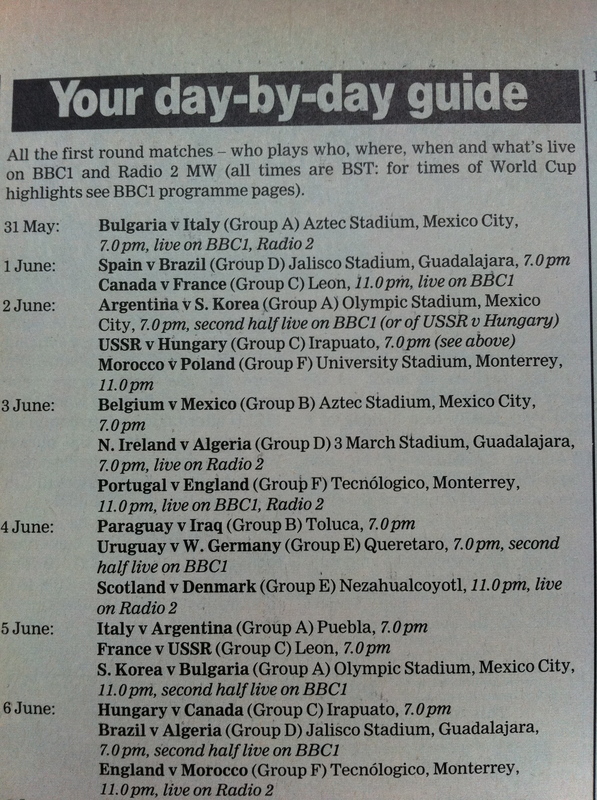 I was over-the-moon, especially as the first match was this very day, live on BBC1 from 6.10pm. But there was another first today, one – with hindsight – of far greater importance. 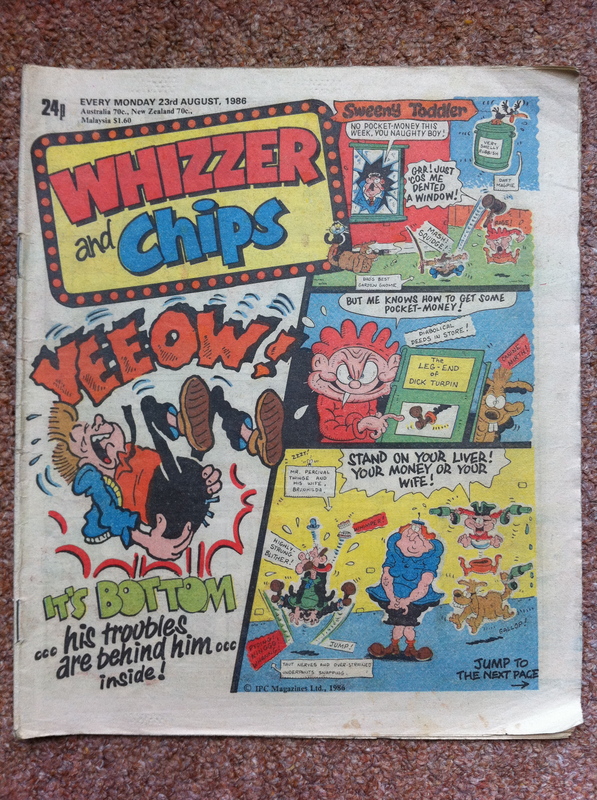 I’m pretty sure this was my debut issue of Whizzer and Chips. I wouldn’t have recorded it otherwise. I bought it while in Oxford, visiting my other grandmother (the one who didn’t live in my hometown) and who had just been taken into hospital. I imagine my parents would have encouraged me to get something to read a) to keep me quiet in the ward and b) to distract me from the significance of my gran’s incarceration. 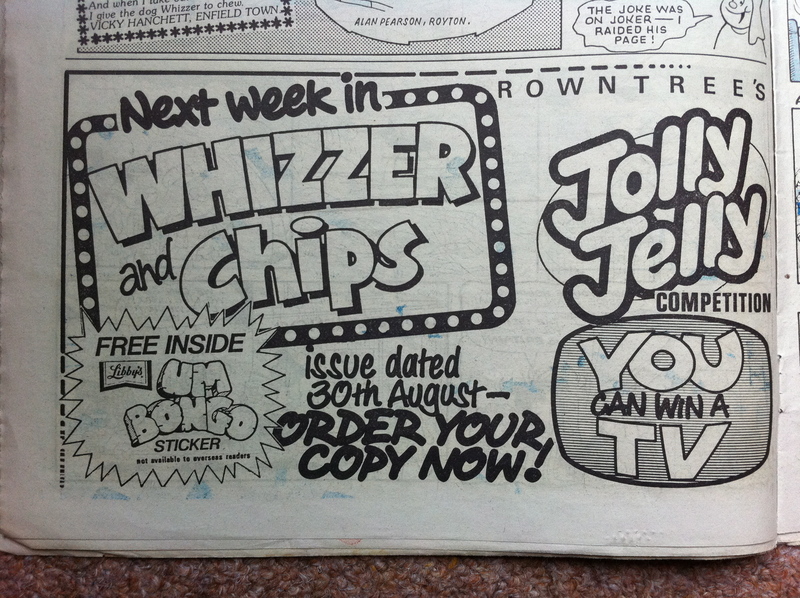 So began an addiction to Whizzer and Chips that lasted at least 18 months. Was I too old to be reading this particular publication? I know I was late to comics, just as I would be late to almost every pop cultural staging post. But I don’t think I sensed, as a 10-year-old, anything out-of-the-ordinary. I soon asked for it to be delivered directly to our house, which it was, all the way through to April 1989 and long past the point I’d stopped reading it properly. During the rest of 1986 and ’87, though, I looked forward to its arrival immensely and started to build up a collection. My favourites were always Sweet Tooth, Mustapha Million, Store Wars and Odd Ball. I didn’t like Sweeney Toddler, Sid’s Snake, Junior Rotter or Shiner. Joker looked like it had been drawn in 1936. I never really understood the appeal of the Bumpkin Billionaires, and I hated Mizz Marble. She was a smart-arsed wuss and I feared I was a bit like her. 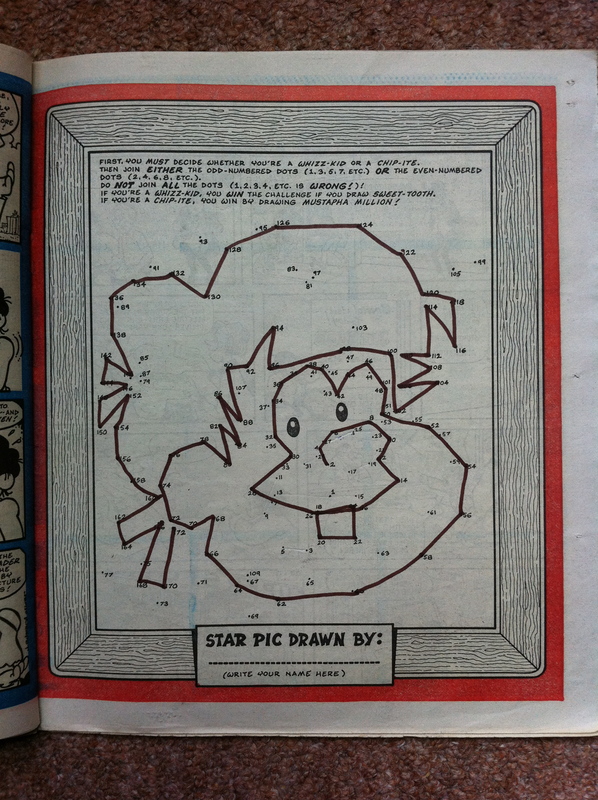 Chip-ites may have been tougher, but Whizz-kids were smarter – or so I believed. That’s right, isn’t it? Tell me it’s right. Meanwhile, in next week’s issue – free Libby’s Um Bongo sticker! …In PE we did Crab Football. With a lot of team spirit and co-operation the final score was 10-1. I wonder, though, if there is anything more excruciating than knowing you’re no good at PE, yet having to wait to be picked by a team captain who is well aware, as soon as they’re landed with yours truly, their team has already as good as conceded half a dozen goals. It had been over two months since I’d last had to play this painful, humiliating game, so obviously it was time to be stripped of my dignity all over again. Still, at least our team got one goal. Despite me setting up at least a couple for the opposition. …Day off again and nearly finished my map. “Second half live on BBC1”? Wouldn’t that be like starting to read a book from the middle? Not that I would have been able to watch those particular games, seeing as they were way past my bedtime. 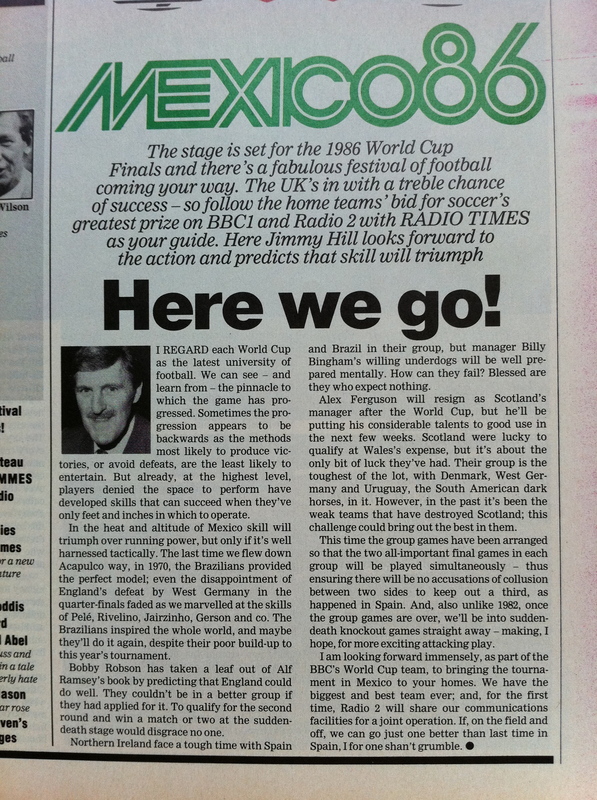 But I can’t deny that I was quite excited by the 1986 World Cup, chiefly for the spectacle, the history, and the novelty of all that TV schedule-shunting. I wouldn’t have been able to tell you who was in the England squad, but I would have been able to tell you what time the first England match was on television, *and* whether it was also on Radio 2 MW. 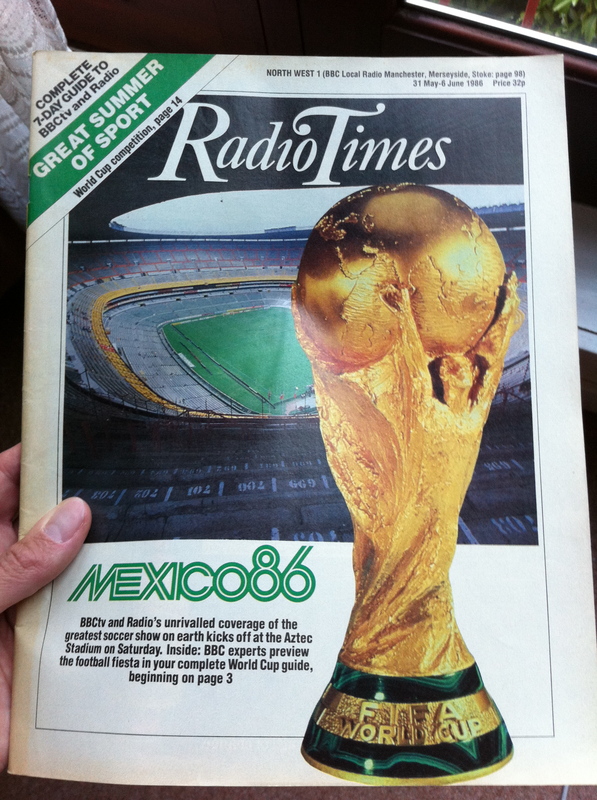 With only days to go until the first game, however, one question above all else was beginning to dominate my every waking minute: just where on earth was my Radio Times/Grandstand World Cup Wallchart? Note: The “map” that I mention in the diary extract was a “map of the local area”, which I’d decided to start drawing the day before. Yes, I know: another map. What can I say? I had a crush* on cartography. And afterwards I went outside to find wood for the fire, before a bowl of broth and a turn in the tin bath. More proof that our family was very firmly rooted in the 80s.